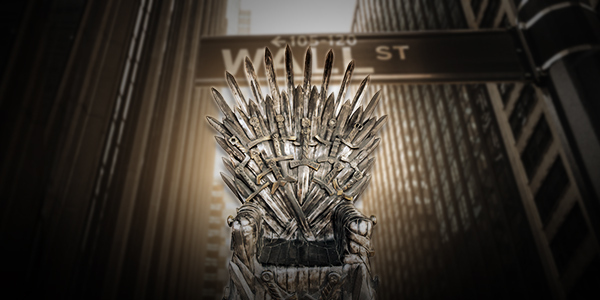 Sunday night it seemed the whole world tuned in to the first episode of the final season of “Game of Thrones” (GoT). The HBO show has been perhaps the greatest series the small screen has brought to us. Its audience stretches around the world and across the generations, enthralling old and young alike. Well over a billion people are said to have watched on Sunday. I’ve loved the series since it started, so definitely count me as a fan. I am often swept away by the multiple story lines, diverse characters, and awesome dialogue; however, it’s the latter that seems to most often apply to investments. The classic summation of the series, it also mirrors many peoples’ view of investments. They think either you win big or you lose big. But, as we learn in the show, many events occur within the extremes. Despite all of the deaths, most survive. In investing, the results for investors are the same: most survive. They may not win big, but they do thrive. What a terrible person the little king was. I would not be surprised if many investors think of Mr. Market the same way. It sometimes seems that no matter what you invest in, the market moves in the other direction. Whatever it can do to torment you, it ends up doing! In my view, the only way to deal with the market is not to go after the big wins. Rather, put the probabilities of time-tested strategies to work for you to thwart the torments of the market. When faced with making that first investment, many would-be investors feel this way. And there is some basis for their fears. Markets do tumble suddenly like they did last fall. And the declines can be quite deep, as they were in 2000–2002 and 2007–2008 when the market fell more than 50%. Investors seem to forever sit on the edge of their seats trying to weather the crosswinds from every negative news story or media speculation. SPOILER: Despite Jon’s instructions for his fate after his reincarnation, I’ve yet to find an investor who seeks this end. Most investors would welcome a comeback from a bear market for their portfolios. Yet there are some parallels to Jon’s dark thoughts among investors. Many investors will abandon the stock market or a strategy after taking a loss. Instead, they seek out investments that may have little downside but often don’t provide the growth they need to build for the future, ensuring that they can’t come back after the fall. One of the most difficult lessons that investors must learn is that you can’t look back. As George R. R. Martin writes, “If I look back I am lost.” Our tendency to ignore this advice is why we as humans fall victim to recency bias and the consequences of loss aversion. Both cause us to abandon investments when we should not, or not to undertake investments when we should. This should be the goal of every investor: avoiding the big fish and evading being eaten. “Avoiding” implies action. In investing, to keep paddling, it is necessary to be active on your own behalf. Diversification through a passive portfolio is not enough. Dynamic risk management adds activity to diversification. Allocation among active strategies tops simple asset-class diversification. Like the Delphic maxim of old, “know thyself,” this GoT quote reminds us that investors need to prepare for investing by knowing themselves. 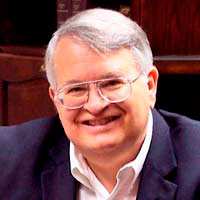 Critical to investing is the answer to questions like “How much risk can I withstand, both in terms of personal assets and state of mind?” If investors use an adviser, it is crucial that they provide information to help complete a suitability profile to let the adviser design a custom investment solution for them. Many investors first approach investing like it, too, is a game. They believe they can do it themselves. But most soon find out that they have lives that they don’t want bothered with investing, they want to vacation when the market is still in motion, and they want an adviser to shoulder these burdens during life’s many phases. That sums up the feeling of many on Wall Street these days, especially among the “talking heads.” And there is much support for their opinions. We are near an all-time high in the stock market, so investors may easily be feeling “safe and happy.” Yet there are crosscurrents of market news. There is no unanimity of opinion. Brexit, trade, taxes, the beginning of a new political cycle—all of these, or any one of them, could change the market’s direction and leave investors with a mouth full of ashes. As they say on GoT, the stars are aligned for success. Only in our case, it is a vast array of studies that continue to suggest gains in the immediate future and the probability of an advancing year. For example, today is Tax Day. Over the last 20 years, the S&P 500 has been up 75% of the time over the next one-week and two-week periods. Since 1955, the results have been positive 69% and 63% of the time, respectively. 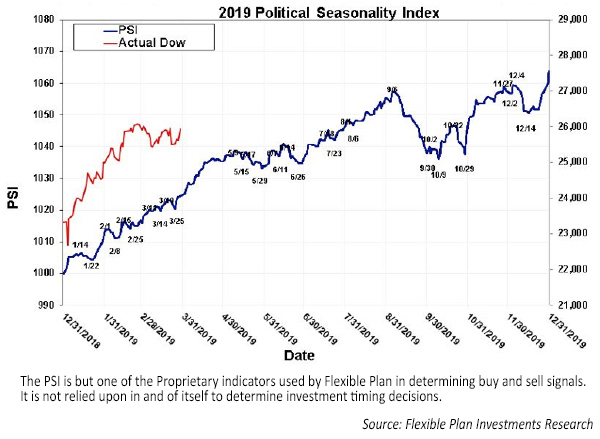 Similarly, our Political Seasonality Index is positive over the next three weeks. Tech stocks have already rallied over 20% this year. In the past when the Technology sector has risen at least 10%, it has gone on to further average gains of 13%. And when the gains are over 20% this early in the year, the average results have been even higher. 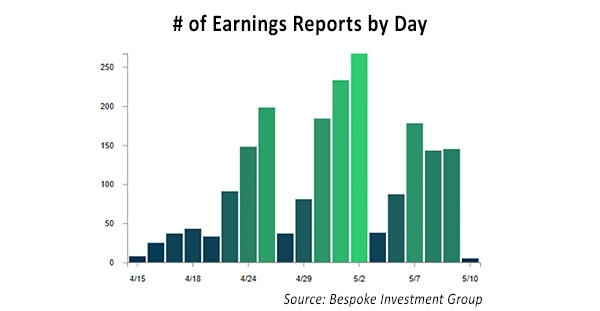 As I reported last week, earnings season is just beginning. Given that the trend in earnings revisions has been very negative, expectations are thus very low for reporting companies. 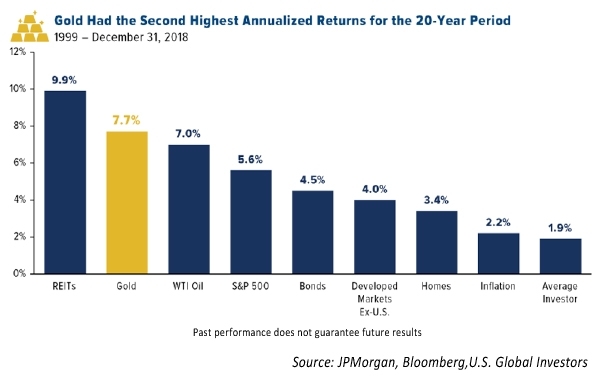 Past results may not be what you would have expected, as stocks have usually gained in value during such periods. This may provide a positive underpinning for stocks through early May. Reviewing reports on the economy, they are not nearly as positive. In fact, last week most reports fell short of expectations. Fortunately, inflation was simply mixed, nothing that should cause the Federal Reserve Board to reverse its current dovish stance on interest rates. Jobless claims were incredibly bullish. Revisions to the gross national product estimates were also quite positive. Historically, this is also bullish for stocks, even after the upward-revisions plateau. There were no major changes to our regimes or our investment strategies. Both remain positive for stocks. Of course, with the market soaring, it has returned to very overbought levels. 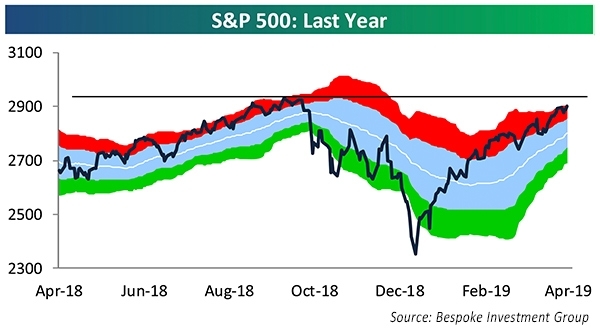 As the following chart shows, stocks can remain in this red zone for a very long time, generating gains for investors. But the chart also shows that when it hits the upper limits small corrections can occur. So be forewarned that a dip may be coming regardless of the other good omens. This may mean that now is not the time to add to positions and that you may be able to take advantage of lower prices to come. But to do so, you are going to have to be nimble. All but very active traders should probably just stick with their portfolios of dynamically risk-managed strategies.